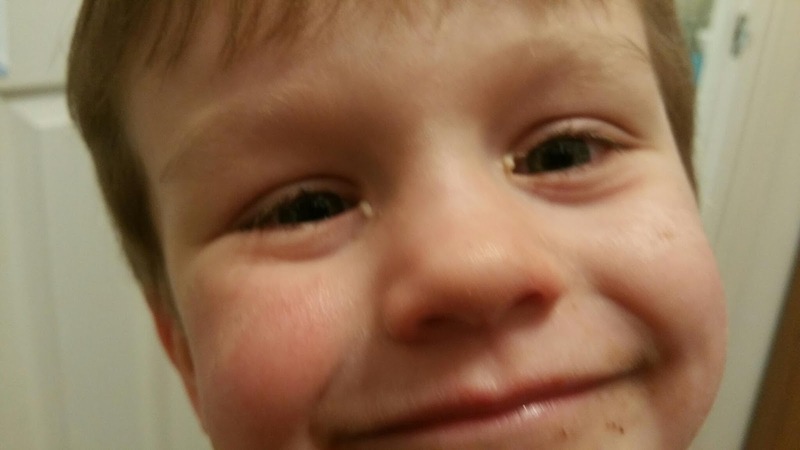 Everyone is ill at the moment, we've all got coughs and colds and both the little ones have conjunctivitis! 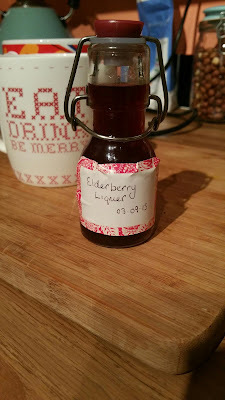 We tried a swig of the homemade Elderberry Liqueur that was given to us by a friend, and although it was strong enough that we probably could have drank until we forgot about being ill, I can't say I felt the medicinal properties. Still we can't have a moments rest, far too much to do. The recent storms have once again torn the felt off the shed roof, and the existing felt was so thin and flimsy I'm surprised it's even lasted this long. Rather than replace it with more of the same I got a roll or premium grade green mineral felt used on flat roofing and re-felted the shed in that instead, it's more than twice as thick and heavy as shed felt so ought to last the next 10 years without me having to slide around on a stepladder in the mud again! If the neighbours didn't already think I was mad then they surely do now after watching me carry the strips of felt up the ladder on my head on a miserable grey day. At least the shed is watertight again, ready for the arrival of the quail next month. Then we nipped in to town to drop off some post for the businesses and whilst we were there I dashed in to the place we get our cheap spice from to get some more ground ginger for our ginger beer, and Logan decided to start asking me some of the many questions 3 year old boys ask, resulting in me picking up the jar next to the ground ginger. It wasn't until we got home that we nearly had madras curry powder beer instead! Then Carly cut my hair as I was starting to look like Chewbacca. Today I have roasted a chicken for the first time in history. Generally I stay away from cooking since Carly is so good at it, this was probably the first time in a decade that I've had anything to do with Sunday dinner and I'm amazed I didn't burn it beyond recognition, but it actually came out perfect. Hope everyone had a good weekend, We always love hearing what you've all been up to! Hope you're all on the mend soon. Try the elderberry in hot water, with a squeeze of lemon juice and a spoonful of honey. We had a ginger beer plant when I was a child, now I think that I need to get one started here. Sourdough bread is so tasty but it does take several weeks for your starter to develop its full flavour, in the meantime try using a good bottled ale for the liquid, I like Spitfire for a lighter loaf or a dark ale for a really deep flavour and colour. Hope you all get better soon.